I woke up this morning and the first things I thought were 1- Why is my bed so comfortable? and 2- Why does my room smell like daffodils? After those first few seconds of foggy confusion passed I remembered that I was home for the weekend and that means a queen sized bed and fresh flowers from the garden by my bedside. It also means access to an ice cream maker and waffle iron and that sounds like a winning breakfast combination to me. I've already made two ice creams and a sorbet, (which will be revealed at a later date) so I set about making some wonderful cornmeal waffles (a Dorie recipe) with maple blueberry sauce and orange segments for breakfast. However, my waffle maker is not the most efficient machine ever, it only makes two waffles at a time and takes about 8 minutes to make those two. That means that once the batter is made, there's a lot of in between time while waiting for a whole batch of waffles to cook. So I popped open the laptop and clicked over to Tastespotting, (an addictions of mine) and one of the first pictures I saw was a Daring Baker cheesecake pop. Uh oh, who posted April's challenge early? I checked the link to see who it was from and was surprised when it was none other than Tartelette. At this point I started to wonder if I had misread the posting date. Helene wouldn't do something stupid like posting a challenge early but I was sure that this month's challenge wasn't supposed to be up until the 30th. I clicked onto a few other Daring Baker websites and quickly realized that I was in the wrong and that if I didn't start typing, my post would be one of the late ones. Luckily I had already completed the challenge weeks ago, (which is somewhat shocking in and of itself as I'm generally the queen of procrastination) so all that was left to do was to slap together a post and do a little photo editing. But then I had to finish making waffles and once that was done I realized it was a gorgeous sunny day and I needed to go on a morel hunt, (more on that later too) so here I am, finally getting around to writing something about those adorable little treats on sticks. So about the cheesecake pops: I made mine orange scented by mixing the zest of two oranges into the sugar before proceeding with the rest of the recipe. 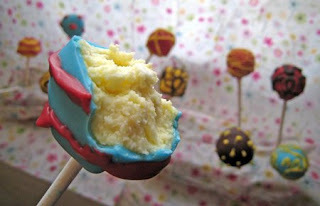 I used Wilton wafers to dip my cheesecake pops and they were really easy to work with. Speaking of the Wilton wafers, have to thank a certain Cream Puff for doing some of my shopping and bringing me the Wilton wafers as well as the lollypop sticks. Shortly after the challenge was announced I had emailed Ivonne, asking her if she knew where I could find both of those items and she told me about a place called Golda's Kitchen, a kitchen supply store in Toronto that I can't believe I had never heard of before. 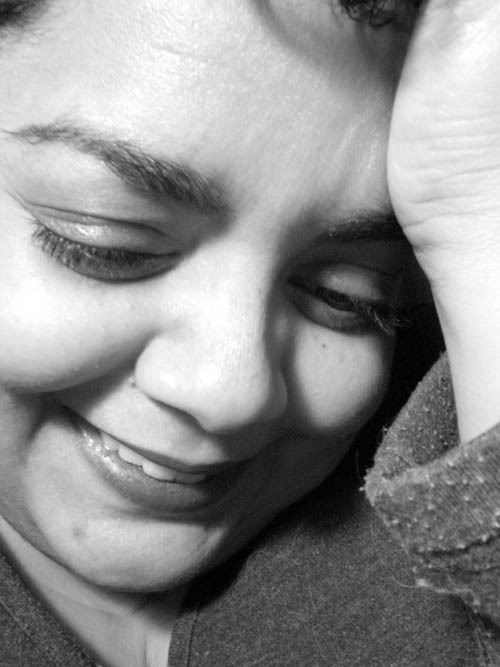 As luck would have it, Ivonne was also planning a visit to Golda's and asked me if I wanted her to pick anything up for me while she was there. I browsed the website and found way more goodies than I could afford. I decided to stick with what I needed for the challenge and just got the wafers and lollypop sticks, (and maybe some silver dragees for an as yet undetermined use). Thanks Ivonne, they were much appreciated! I brought my completed pops to a potluck lunch and didn't return home with any, which is always a good sign. Cheesecake pops certainly make for a fun and whimsical display, but I'm not itching to make them again, they were messy and took forever! That's not a comment on the recipe, but just on the nature of cheesecake pops. They require multiple steps and quite a bit of time and don't fall under my usual slogan of "Go Big or Go Home." They were tasty and pretty though and something I had wanted to make ever since I saw Bakerella's Cake Pops so I'm glad I got a chance to make them. Big thanks to our hosts this month Deborah of Taste & Tell and Elle of Feeding My Enthusiasms, I was very happy that they chose this recipe. (which can be found in Sticky, Chewy, Messy, Gooey by Jill O’Connor). As per usual, you can check out a multitude of cheesecakes on sticks by visiting the Daring Bakers Blogroll. Posted by Brilynn at 5:18 p.m. I love the pops! The colors are so bright and cheery and kinda remind me of the Whimsical Bakehouse book. They do leave you thinking you are in the midst of a fairy tale forest. Lovely color combos! These are all so pretty! I love the colors. These pops are colorful and gorgeous! I can't wait to see what you do next! Wow, your pops are so pretty and festive! I love how colorful they are, and the orange cheesecake sounds to die for. So colorful and fun...I love the back drop too...very Spring. I love all of the colors and decorations!! I did part of mine with the melts, and liked them better than the ones dipped in chocolate. Great job!! these pops look too good to eat. Such vibrant colors!! It's no wonder you returned home from the potluck empty-handed! Great job! Why am I reminded of Horton Hears a Who with your pops? They are cute and whimsical! These are SOOO cute! I'm trying to figure out what they make me think of but I can't come u p with it...maybe Alice in Wonderland? Great job...I didn't get to do this challenge b/c of lack of space in the freezer and lack of a reason. Yours are precious! 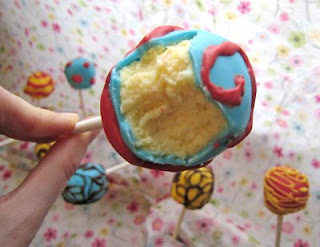 I've been reading lots of DBers posts today, and your cheesecake pops are the first ones that really look like candy. Love the colors and the playfulness. Brilynn, these are so cute! I love how colorful and whimsical tey are. Great job! Pop Art Pops. How colorful and fun they are. Your colours and designs are very striking - I love them! I waqs way more lazy than this and just dunked them in regular chocolate and sprinkles. i could have sworn they were due on the 30th, too, which is why mine just now went up. yours are fabulous! i love those colors! wow they look great!! wish i could be so colorfully creative!! So, so cute! I love all the colors and how cheerful they look. Fabulous! What a beautiful spread of colors...that would make anybody happy in the morning! Awesome decorations! They're as colorful as spring flowers. Love all these colors Brilynn and all your fancy swirls! I know you always want to go big but in this case I think this is just the perfect serving bite of big flavor and big richness! I did the same thing...I could have sworn the posting date was later. Love yours! They look very fun and tasty! Hmm, I think they look pretty cute. I want some waffles, too. The pops are beautiful and have gorgeous colours!! OMG, those pops look gorgeous! I love your pretty decorations! Neat job! I fight you for that title! My thoughts followed the same track... someone posting too early, no, wait, I'm late! The colors are so pretty and party-ish. Love them! Brilynn, your pops look adorable! Great job!! They are absoluteley beautiful, I love the festive colors. Bright and cheery for Spring. 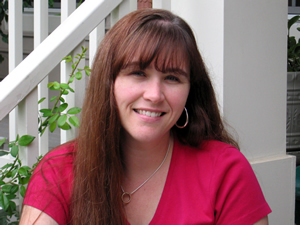 I thought the same thing about posting early when I saw other blogs had posted. Good thing I checked! Your pops are so fun! I love all the different colors! If it's any consolation, I came home from vacation yesterday and saw those pops all over tastespotting too. YIKES. I had made mine earlier in the month... so organized yet I had that 30th date in my head too. After a bit of scrambling, I finally had it posted last night. I hate being late for things. I LOVE the psychedelic colors that you chose. That yellow really comes through nicely to make them look really cool. Brilynn, the look like fairyland pops! Beautiful looking cheesecake pops you got there. Beautiful colors. Wow, wow, wow! I'm impressed and speechless! Great job! Your pops look so colorful and cute! 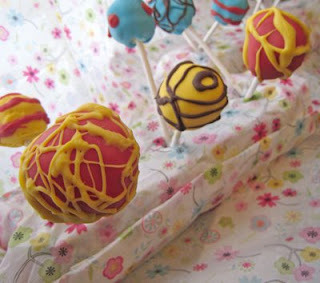 WOW oh WOW, stunning chessecake pops!! Well done! These are so darling! I love the pop of the bright colors. Who could refuse one of those treats! I had the post date scrambled in my brain, too. I was scooping and dipping when I should have already had it posted. Oops. Bri, these look like something out of Alice in wonderland. They are so pretty!! Love the colorful array of toppings and coatings! Those are simply amazing Brilynn! Whimsical, colorful and funny... great job!!! Your cheesecake pops are just beautiful. I love all the colors! I bet the orange cheese cake is delicious! Your pops nice and colourful and good! I like the sound of using the orange zest in them. They're almost too pretty to eat. Great creativity! Your pops turned out sensational-brilliant colours! Simply Divine...I love all the festive colors and decorations. Oh Brilynn -- My god, I'd never discovered tastespotting before, and wow -- you've created a new addict! Why am I not surprised your pops are totally amazing and incredible!?!? 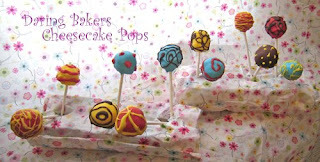 They are a truly eyecatching display of cheesecake pops. Another beautiful example of these guys. I want to make them! Gorgeous pops! I love the colors and the varieties. Maybe we could start a personal shopping for cooks business where we go out and buy people all the stuff they need to cook/bake!!! Seriously, though, no worries. It was a lot of fun and your pops, to me, look like the very embodiment of spring! Brilynn, I love all the colored chocolate you used! Beautiful, colorful, and delicious pops! They look so pretty and colourful. And I get they taste great too! Your cheesecake pops are incredibly artistic. Well don!! Ashbjdbk!! Without a doubt, the cutest cheesecake pops in the Daring Bakers. I love them! Love all the colors! Your pops are awesome! Cute, cute, cute! No wonder you didn't return with any! It would be hard to choose a favorite--they are all so pretty! in french, I would say "géniaaaaaaaaal ! j'adoooooooooore !!!" in english it sounds like "terrrrrriffiiiiiic ! I looooooove it !" Congratulations for that huge success ! Wow...they look inspiring to say the least! !